UIL Competitors - We are so proud of them!! 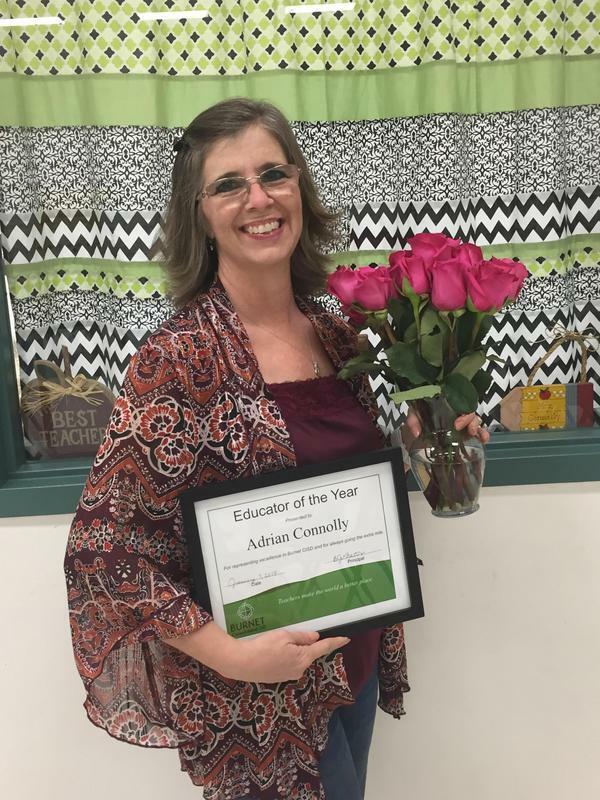 Mrs. Connolly was named BCISD Teacher of the Year for 2018 at the Burnet Chamber of Commerce. We are so proud of her. Reading Under the Stars Night - Thank you PTO for providing the hotdogs, popcorn and cookies! The Board of Trustees adopted the 2019-2020 School Year Calendar at the February Meeting. RJ Richey is proud to announce our 2018/19 Educator of the Year, Mrs. Adrian Connolly! This is Adrian’s 24th year at BCISD, and 4th year at RJ Richey as our Fine Arts teacher. Adrian was also named VFW Post 6974 of Burnet Teacher of the Year in November for her dedication to honoring our Veterans every year through our Veteran’s Day program. Adrian goes above and beyond her normal role as a teacher to make sure our students feel loved and supported. She truly exemplifies Spirit, Pride and Honor! Congratulations Adrian! 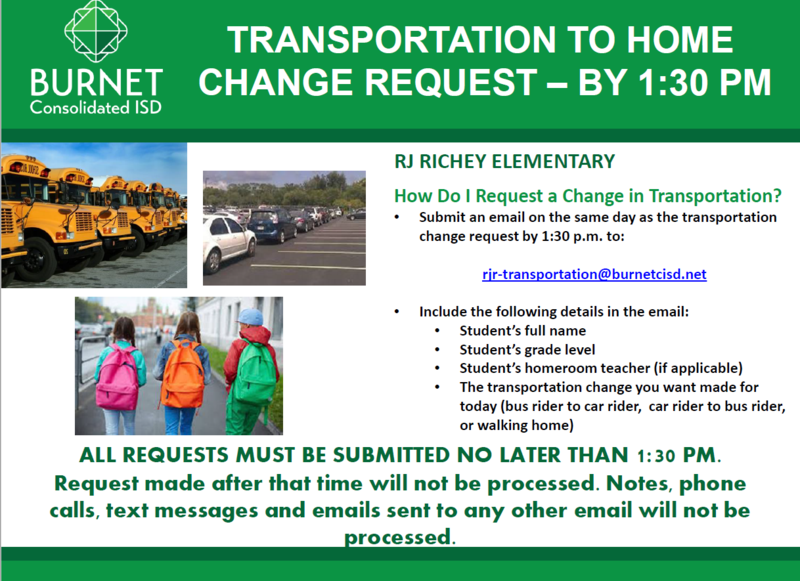 Burnet CISD has developed a new process to streamline a parents request to change how a student is getting home (bus to car, car to bus, walking). Please see the attached information on how to place these request. Volunteers: If you would like to be a volunteer on campus (this includes volunteering for field trips, book fairs, classroom room parent, reading with students on campus, Watch Dogs, helping teachers with copies, cut-outs,etc.) you will need to go to the district website and complete the volunteer application. It's super easy and takes about 2 minutes! Once you complete the form, it will cover ANY campus you want to volunteer on. It DOES NOT carry over year to year. Thank you VOLUNTEERS!!!! 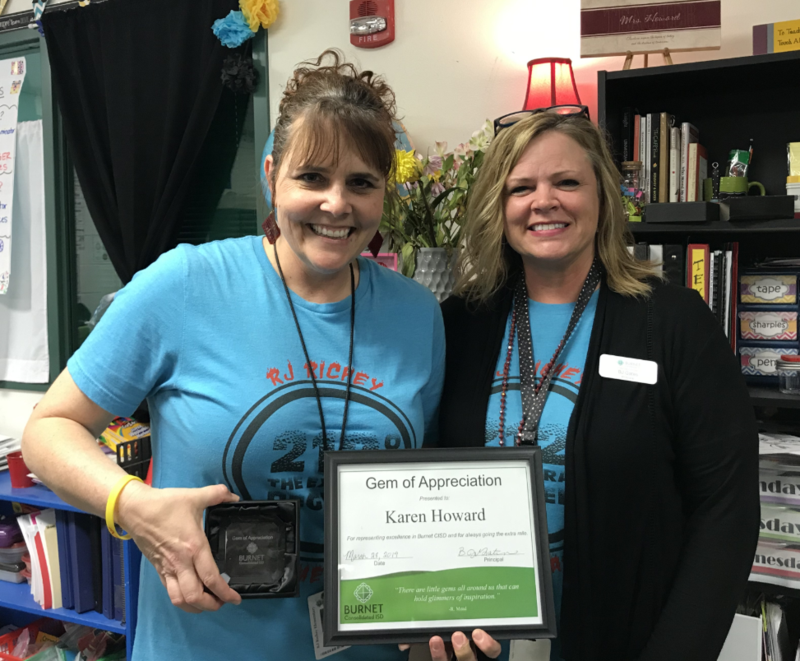 Congratulations to Karen Howard for being nominated as RJ Richey's March GEM! Mrs. Howard came to RJ last year as a third grade teacher and has been a true asset to her team and campus. She organizes our Bulldog Nation News every morning and has trained our 5th graders as newscasters! Thank you, Karen, for always going the extra degree! 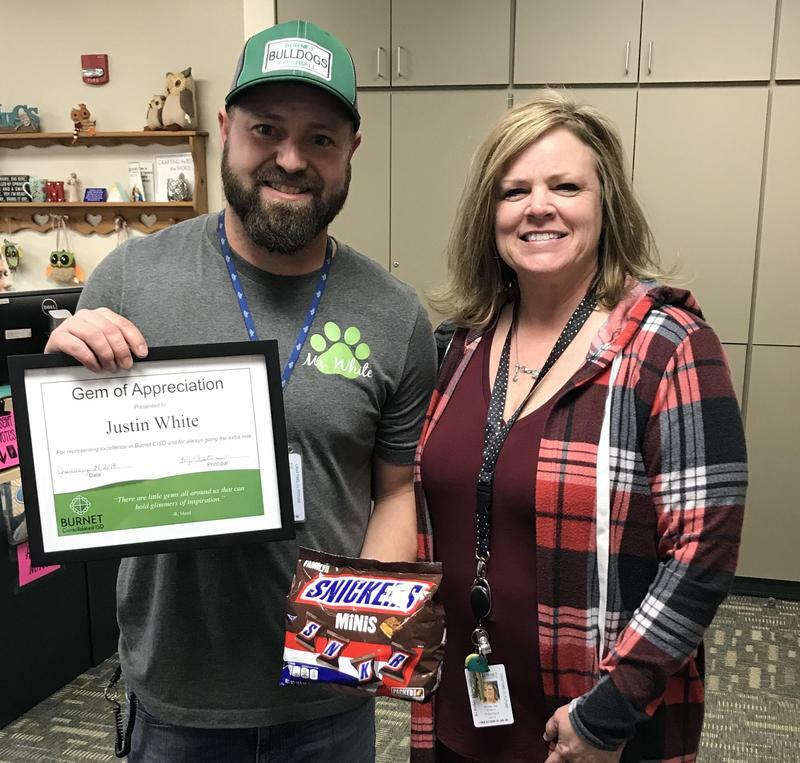 Congratulations to RJ Richey's January GEM, Mr. Justin White! Justin makes a positive impact on students every day. He is always willing to help staff and students. He and his team have built relationships with our students and bring out the in best in them! He is knowledgeable, caring, consistent, and definitely is going the extra degree at RJ Richey!